WHAT WOULD IT BE LIKE TO FIND SHELTER INSIDE A TREE TRUNK? We would need to cross the growth rings, feel the narrowness of being inside wood and excavate our way out through a zigzagging path. 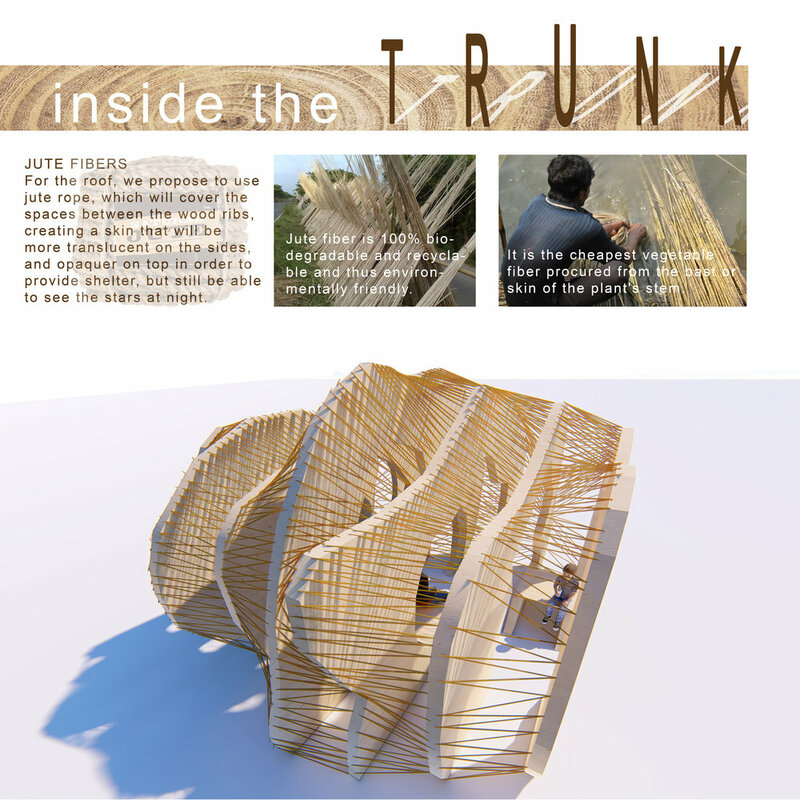 Our Sukkah explores this idea and tries to recreate these sensations, using natural materials; wood for the structure, which resembles the growth rings, and jute for the roof, that acts like the tree bark providing an enclosure. 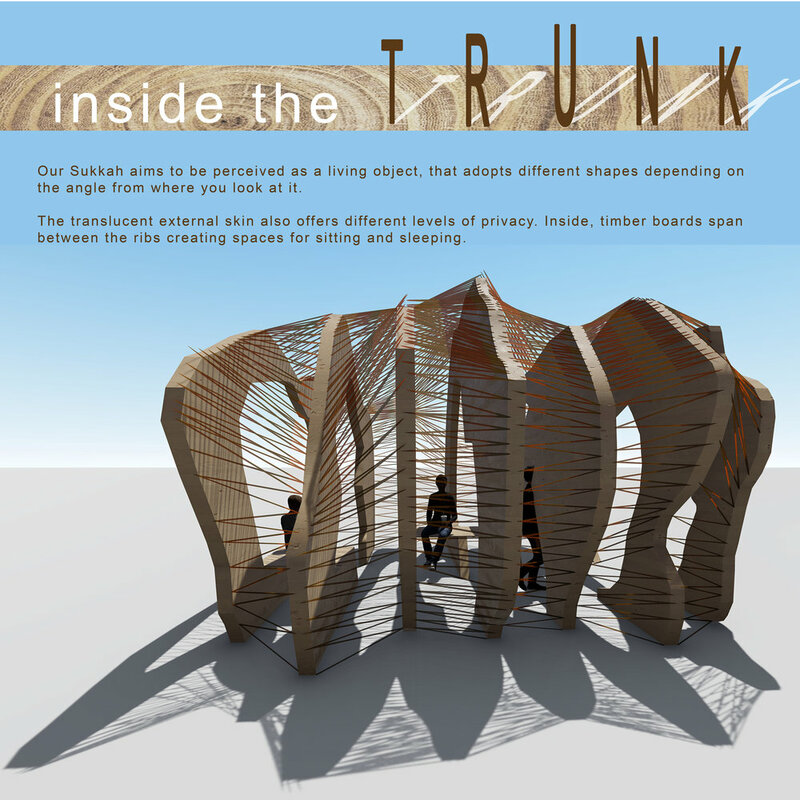 Our Sukkah aims to be perceived as a living object, that adopts different shapes depending on the angle from where you look at it. The translucent external skin also offers different levels of privacy. Inside, timber boards span between the ribs creating spaces for sitting and sleeping. THE STAR OF DAVID In order to guide us through the path that goes across the Sukkah, a star of David can be seen from the entrance, like a ray of light that helps us find our way. JUTE FIBERS For the roof, we propose to use jute rope, which will cover the spaces between the wood ribs, creating a skin that will be more translucent on the sides, and opaquer on top in order to provide shelter but still be able to see the stars at night. Jute fiber is 100% bio-degradable and recyclable and thus environmentally friendly. It is the cheapest vegetable fiber procured from the bast or skin of the plant's stem.